Clare have reached a second straight McGrath Cup Final thanks to a comfortable win over Waterford. Colm Collins’ side ran out 1-17 to 1-06 winners at The Gold Coast Resort in Ballinacourty this afternoon. There were 55 seconds on the clock when Cian O’Dea kicked the first point of the game, putting Clare into a lead they would never relinquish. Colm Collins’ side were dominant throughout most of the first half and would score 1-8 before Waterford registered their first score. Two Clare points each came from captain Gary Brennan and Dermot Coughlan, who was making his debut, with the rest scored by Dale Masterson, Kieran Malone and Gavin Cooney. That was in the 29th minute – Waterford registered the last two points of the half but trailed 1-8 to 0-2 at the break.Waterford also scored the first point of the second half, but Clare were still on top. Gavin Cooney scored three points after the break, while David O’Halloran and substitute Gearoid O’Brien scored two each. Another substitute, Niall Ellis, also pointed before Dara Bohannon closed scoring matters with a fine left-footed score. Towards the end of the game, Waterford had edged their way into the game, with their high-point coming after 33 minutes of the second half when Jason Curry converted a goal chance. However, Clare ran out comfortable eleven point winners. 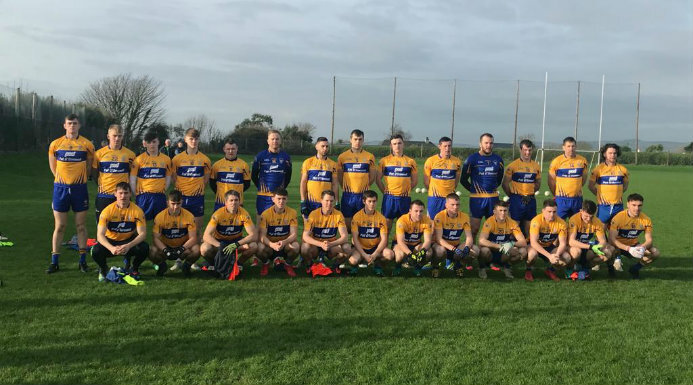 Clare: Robert Eyres; Kevin Hartnett, Cillian Brennan, Jayme O’Sullivan; Conal O hAinifein, Dean Ryan, Dale Masterson; Daragh Bohannon, Cathal O’Connor; Cian O’Dea, David O’Halloran, Dermot Coughlan; Gavin Cooney, Gary Brennan, Kieran Malone.